Australians are renowned world-wide for their achievements inswimming pools. Davey has achieved an enviable reputation for offering some of the most reliable and efficient Australian made pool pumps and filters available. To ensure that your achievements and time in your swimming pool are successful and trouble free, make sure you insist on the highest quality parts and most efficient designs in all of your pool equipment. Depend on Davey. The Celsior® spa bath pump range is a revolution in the spa industry: for the first time, an Australian designed and manufactured water cooled ‘Heat Maintenance Technology’ spa pump is available. This new technology motor offers many advantages over older style pumps, including up to 50% less noise, up to 97%-efficient energy usage (as waste heat helps maintain the bath temperature) and as many as 5 seperate safety features. The Celsior® range also features options for inbuilt ‘Heat Boost’ models to maximise the water temperature and premium bath-side touchpad controls – for a stylish finish in any bathroom. As you can see, a real revolution in your bathroom. At Davey, we’re committed to ensuring you get the very best from your swimming-pool or spa with a range of pumps that means sparkling clean water with a minimum of fuss. 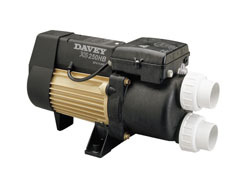 The Davey pump you choose will circulate water through your system enabling optimum filtration, heating (where needed), and the even distribution of pool chemicals. Davey pool pumps feature highly efficient hydraulic design, ensuring that the pump is economical to run and has very low noise levels. The Pool Pump range features silicon carbide seals and stainless steel components for long life in the most demanding environments. Davey’s XS range of spa bath pumps is specifically designed to circulate water through spa bath jets to provide a soothing and relaxing massaging effect. With whisper-quiet and efficient operation this range of pumps will bring to life spa baths of any shape or size. The XS range also features inbuilt heater models to keep the water warm, plus bath-side touchpad controls for a stylish finish in any bathroom. The Davey Aqua Select range of spa bath jets and fittings lets you select the perfect spa in every way. Tailor each spa jet to exactly the pressure you want for every part of your body – firm for sore legs and gentle for upper body relaxation. You can also mix and match the colour of the spa fittings to match your bathroom’s décor.